It’s the stuff of a fairy tale. A teenage Barbadian beauty sings Mariah Carey’s “Hero” in a school show. A music producer on a Barbados vacation brings her to the United States, her voice catching the ear of music mogul Jay-Z, who quickly signs her with Def Jam Records. Her first single reaches #2 on the U.S. Billboard Hot 100. Within a couple years, she would record and release three albums, and by 19 become one of the richest teenagers in America. This is the story of Robyn Rihanna Fenty, known simply the world over as Rihanna. The music producer’s name is Evan Rogers, and he co-wrote Rihanna’s smash debut single “Pon de Replay” with his partner Carl Sturken and Rihanna herself. Her first two albums were meant to reflect her own story – a once simple girl is thrust into a world she never thought existed – but by her third album, Good Girl Gone Bad, Rihanna intended to showcase the huge difference from her Barbados days to modern times. The single “Umbrella” became the longest running number one single in years. Since that start Rihanna's fame has exploded and she's now one of the biggest stars in the world. She's also super hot of course as you can see here. Get the latest on Rihanna by following our Rihanna tag. Rihanna twerking is one of the great things in life!! She has over 65 million followers! Check out the latest pics and video clips posted by Rihanna! Everything Rihanna including a substantial photo gallery. Early albums included Music of the Son in October 2005 featuring “Pon de Replay.” Less than a year later came A Girl Like Me with “SOS” and “Unfaithful, and in June 2007 came Good Girl Gone Bad with “Umbrella” reaching number one on the Billboard Hot 100. 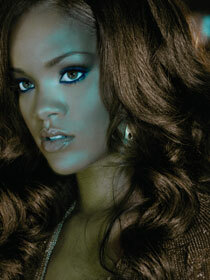 “Pon de Replay” has been utilized in a number of TV and movie projects in the last couple of years. Rihanna’s acting debut is a cameo in the third “Bring It On” film.